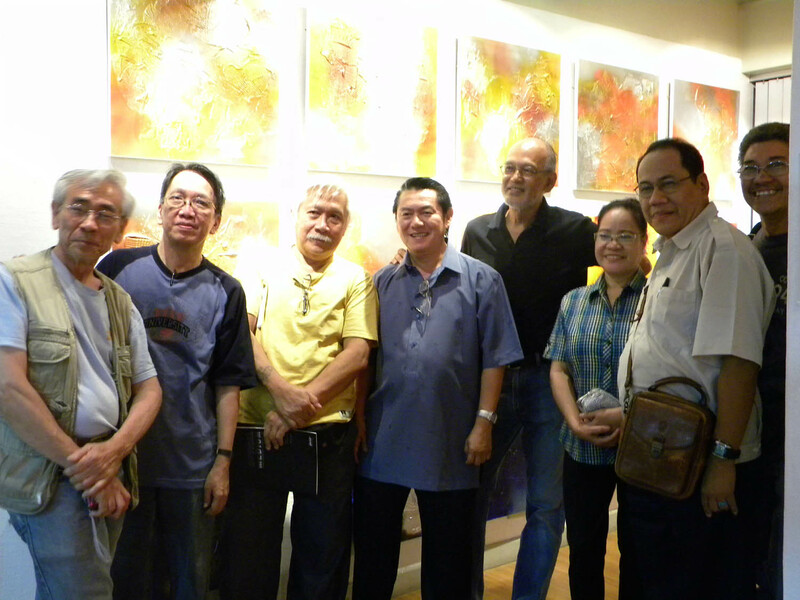 Three exhibits opened last April 27 at the West Gallery at the Mary Santos Artcade, 48 West Ave., Quezon City. 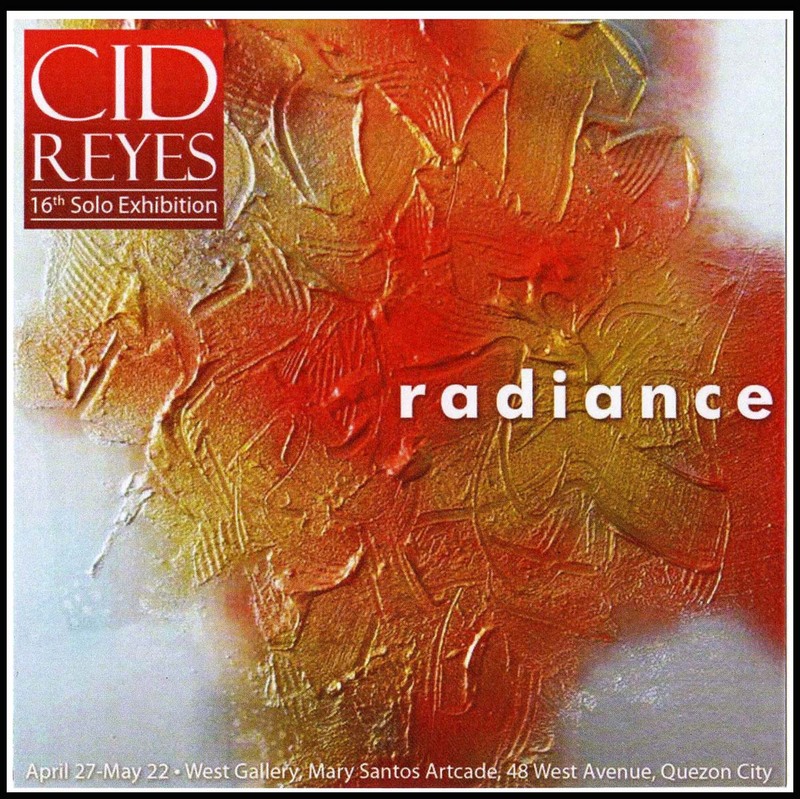 These are Recent Works by Steve Santos at Gallery 1, Pictures at the Exhibition by Pandy Aviado at Gallery 2, and Radiance by Cid Reyes at Gallery 3. The exhibits are on view until May 22. At Gallery 1, Steve Santos, in his latest exhibit, veers away from focusing on a singular subject or concept, opting to concentrate his creative energy on urban landscapes in acrylic. 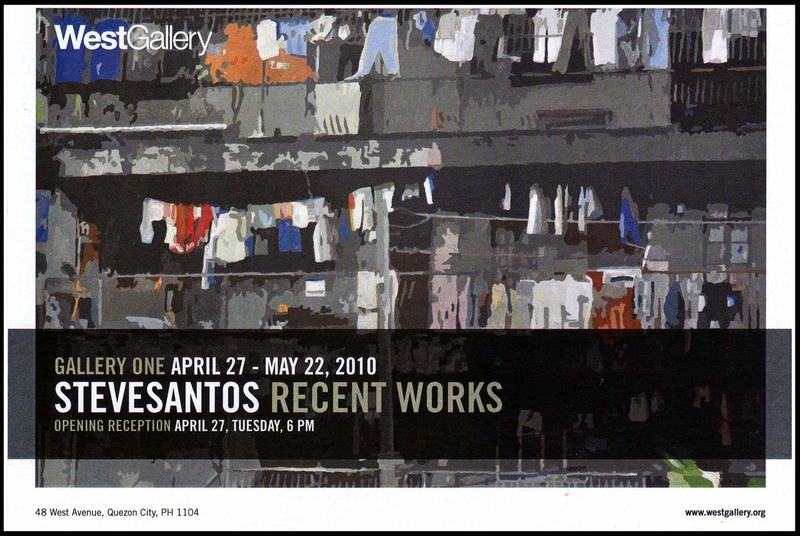 “It allows me to show patterns and the composition of a city or a location’s specific geographic area, its environment and its social patterns,” says Santos, making sure that his works come out the same way as he envisioned them the first time. The result is a collection that reflects Santos’s confidence in his skills and unique quality in letting colors and lines seamlessly form their own rhythm in the composition. As most people hurriedly go about their daily routines, Santos pauses as his brushes breathe life into the surroundings that often go unnoticed. 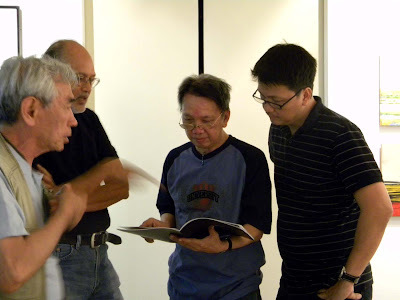 At Gallery 2, Artist Pandy Aviado considers his pieces as “works in progress” until they are sold. For his latest exhibit, titled Pictures @ the Exhibition (Homage to Mussorgsky), he is presenting artworks that were refined over time with layers and layers of paint. The title of the exhibit is based on the musical piece Aviado was listening to while working on the said pieces. 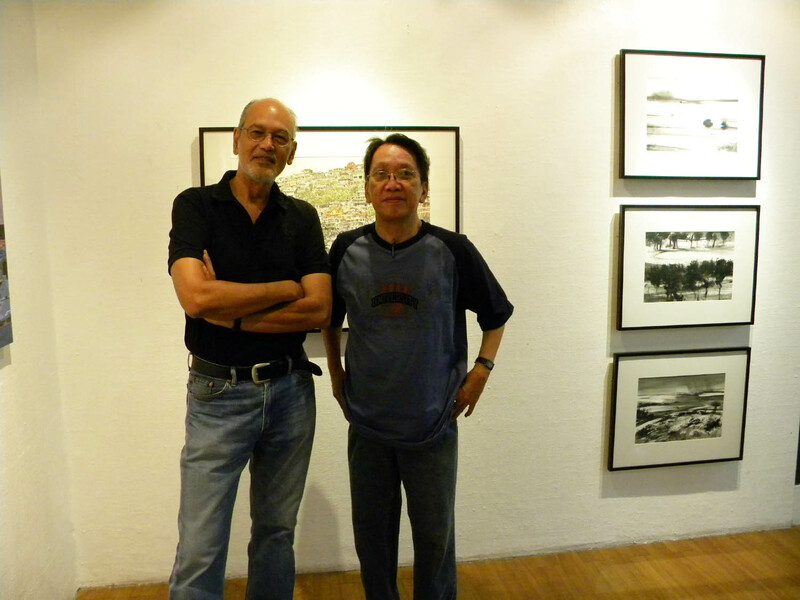 “Most of the images are from my works in the 80s and 90s. The initial image is a print from an etching. Through the years, I paint over them until they end up as a painting,” explains Aviado. 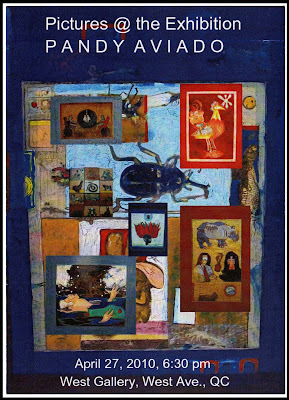 The result is a collection that is meant to be seen primarily in an assemblage or in an intimate space of a collector. 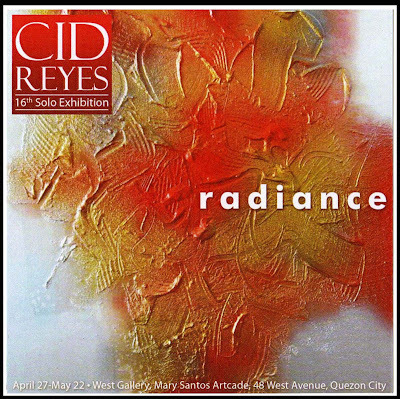 And at Gallery 3, Cid Reyes showcases his recent abstract paintings with the collective title “Radiance.” An avowed abstractionist, Reyes, who is also one of the country’s respected art critics, explores the interaction between light and a highly activated surface. This is Reyes 16th solo exhibition. 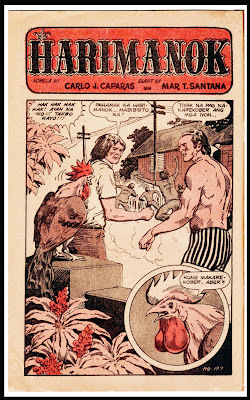 In 1952, Mars Ravelo and Clodualdo del Mundo came up with a komiks novel titled Texas, probably the first one dealing on “talking chickens.” The novel, illustrated by Elpidio Torres and serialized in Pilipino Komiks, was adapted into the big screen with Pancho Magalona, Linda Estrella and Texas, the chicken (would you believe it?) in the title role. 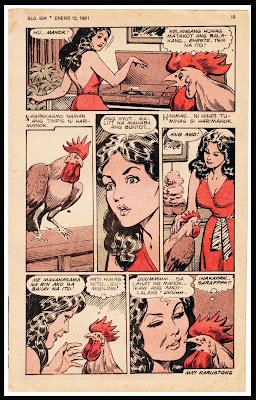 In 2008, writer-illustrator Gerry Alanguilan created and published Elmer, a four-part comic series about the whole chicken race intermingling and interacting with the human race. 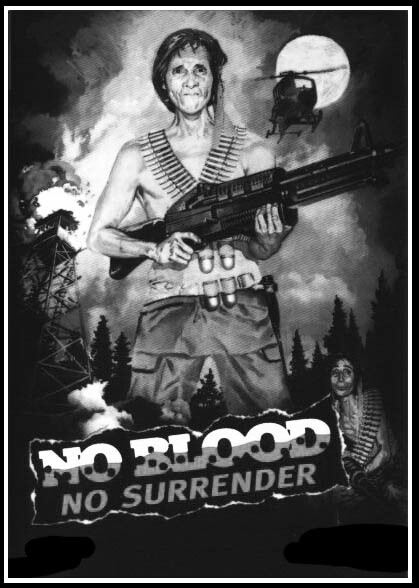 The controversial National Artist (?) Carlo J. Caparas also came up with one in 1981. 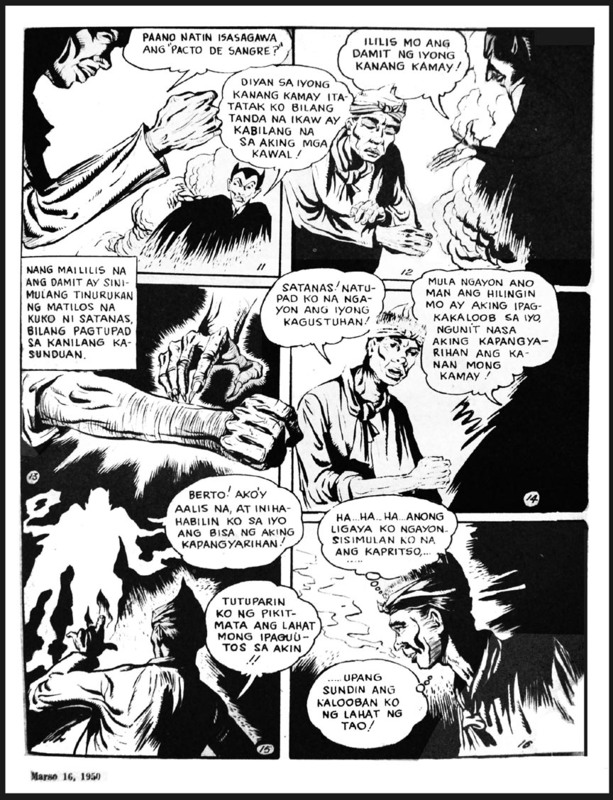 The komiks novel, Harimanok, appeared on the pages of Superstar Komiks. It was drawn by Mar Santana. 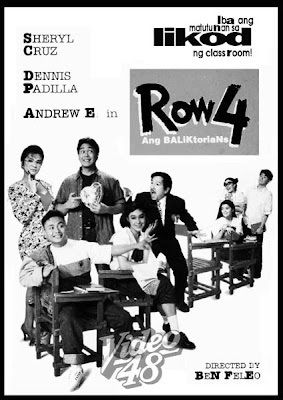 Humanap Ka ng Panget! 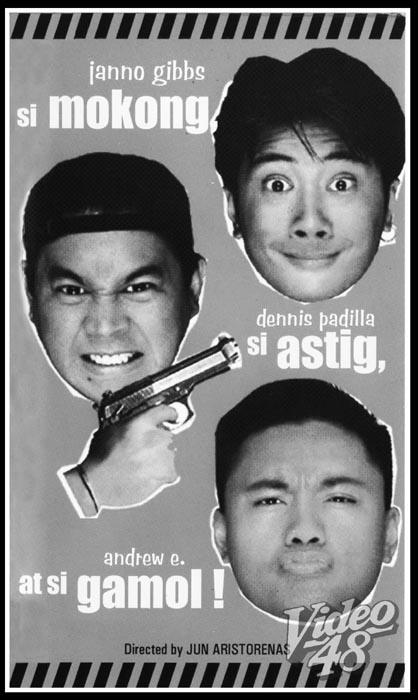 (1991)- Stars Jimmy Santos, Carmi Martin, Nanette Medved, Gelli De Belen, Keempee de Leon/ Introducing Andrew E.
Andrew E. also known as the the King of dirty Rap in the Philippines (the 'E' stands for his last name, Espiritu). Andrew E saw his first glimpse of showbiz as a DJ in a popular club Euphoria. 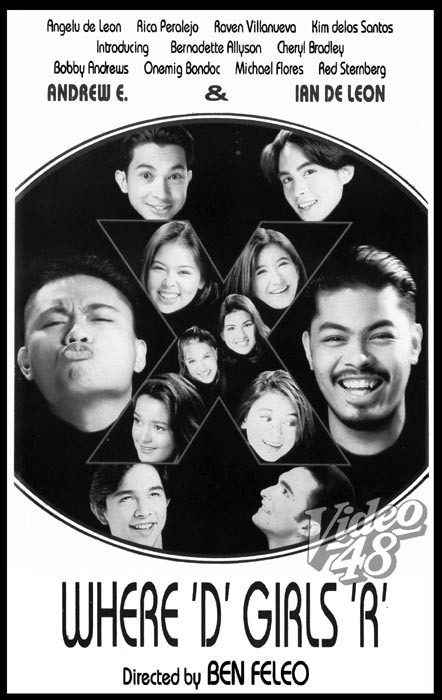 He began his career in December 1990 when he released his first monster hit single "Humanap Ka Ng Panget" ("Look for Someone Ugly"). 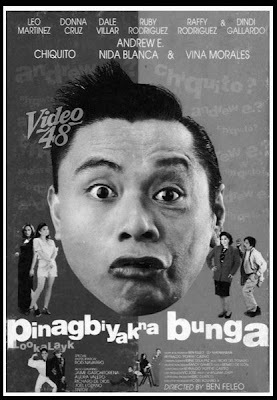 The combination of his catchy story-telling rap style, irresistible beats, naughty and often hilarious lyrics made him popular & unique in Philippine pop culture. 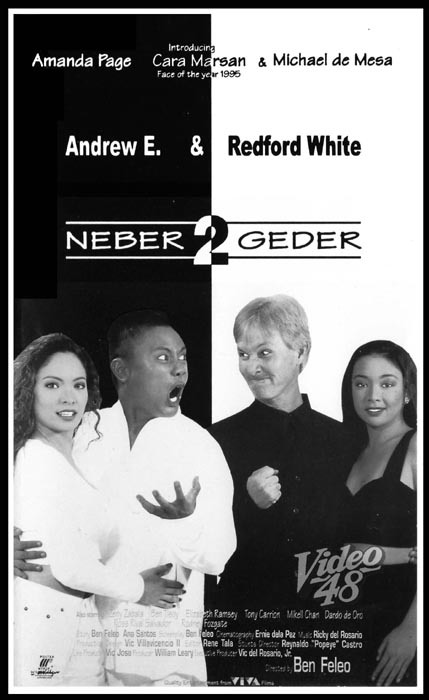 Andrew’s career branched out as he began to star in comedy films based on his songs. He has more than 28 hit films under his belt. 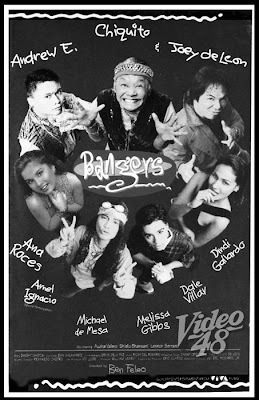 In the mid 1990s, Andrew E founded Dongalo Wreckords for the purpose of discovering and producing new Philippine Rap talents. 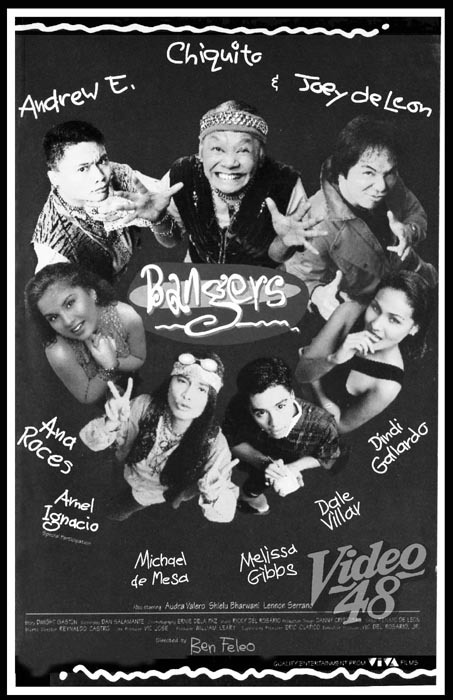 One popular rap group that got its start with Dongalo is Salbakuta. Their song Stupid Luv became a big hit and was made into a popular movie which also starred Andrew. Andrew E spent some time in Japan in the late 1990s, performing in clubs and eventually releasing a song in Japanese about the misadventures of a tourist in Tokyo. He is now married and lives in Dongalo, Paranaque City (where his record label was named from) with his wife and son. Andrew is also a certified platinum artist given that he has acquired over 13 albums, each at least 3 times platinum. 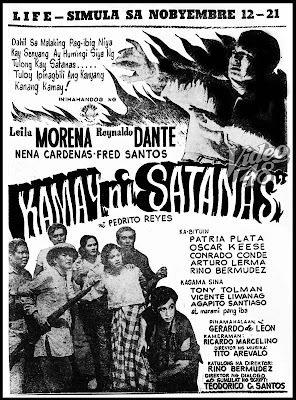 Based on the serialized komiks novel by Pedrito Reyes published in Ilang-Ilang magazine in 1951, Kamay ni Satanas tells of Ka Berto (Reynaldo Dante), an aged 'albularyo' or folk healer, who has a great love for Senyang (Leila Morena), a young pretty lass, the daughter of his good friend. Fearing that he has no chance at all, he sells his right hand to the devil in exchange of youth, good looks and wealth. Veteran comedian Palito passed away Monday morning (April 12). He was 76. Palito, Reynaldo Hipolito in real life, died at 7:05 a.m. at the Philippine General Hospital (PGH) in Manila due to lung complications. 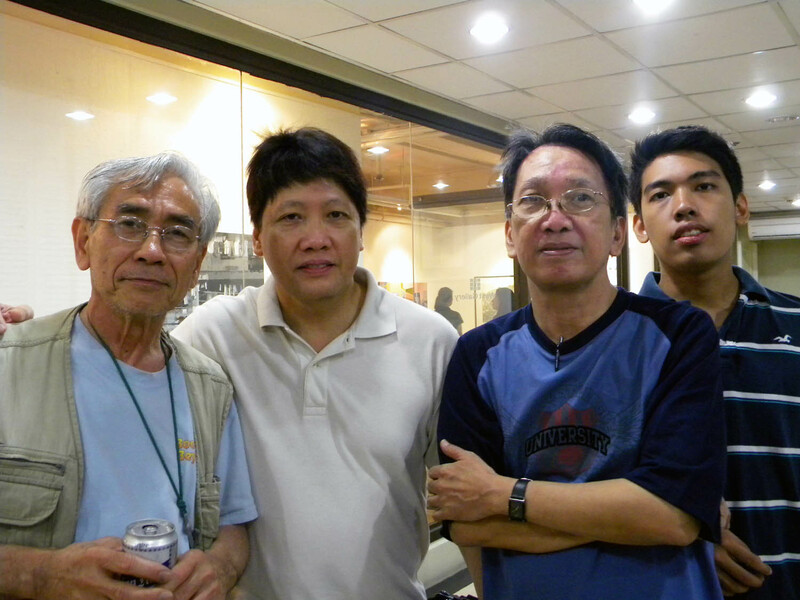 His son, Jhune, said his father was scheduled to undergo a CT scan in a nearby clinic along Taft Avenue in Manila. A few minutes before they were to leave PGH, however, Jhune said Palito complained of severe pain. A few hours later, Palito was declared dead, the son said. 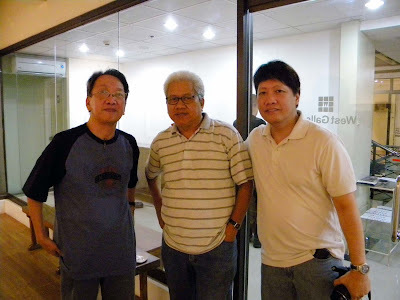 Palito was rushed to the Imus Family Hospital in Cavite last Tuesday after complaining of severe stomach pain. He was transferred to the ward section of PGH on the same night. "Galing siya sa trabaho… Pagdating sa bahay halos hindi na makalakad at nanghihina na...kaya dinala na namin siya sa ospital," recalled Jhune. Prior to this, he had been confined at the hospital for a month due to a lung complication. 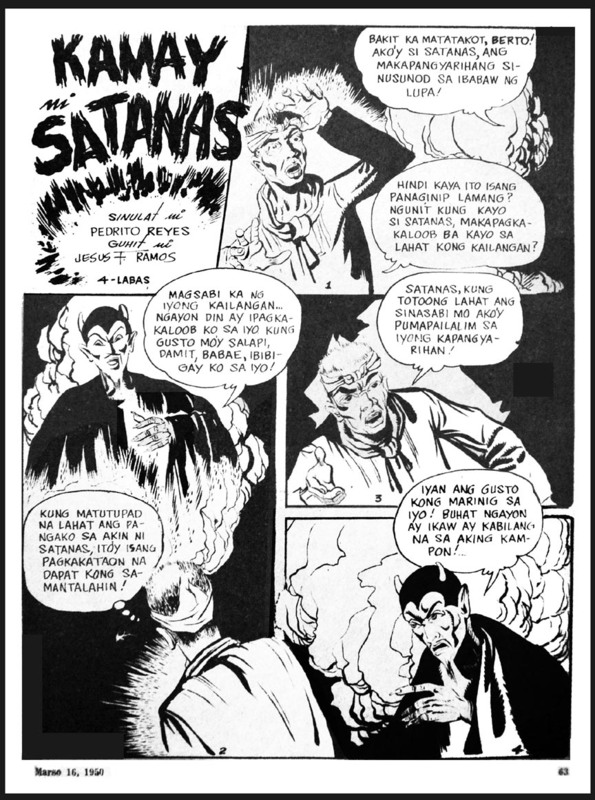 “Kasi po si Daddy, nagii-smoke po siya. Nung tinigil po niya, dun siya nanghina po,” Among the last to see the comedian was former President Joseph “Erap” Estrada, who visited Palito the night before. Reynaldo Hipolito was only 21 when he first discovered the world of stage acting. So enamored was the skinny student of Arellano University in Manila that he decided to choose acting over his studies; but of course, much against his parents' protests. That was around 1959. Hipolito's distinct emaciated frame would serve as his ticket away from doing bit roles. He revealed to PEP the origin of his famous screen name. "Ang nickname ko talaga is Rene. Eh, kung tawagin nila ko, ‘Hipolito, Hipolito' kaya ginawa ko na lang na Palito." Palito, which in Spanish means matchstick, perfectly suited Hipolito's thin physique. But more importantly, the moniker gave the former film extra a catchy name and an identity that perfectly played on Filipino sensibilities, especially in comedy. Goodbye, Palito! You will be missed! Thank you for the memories! 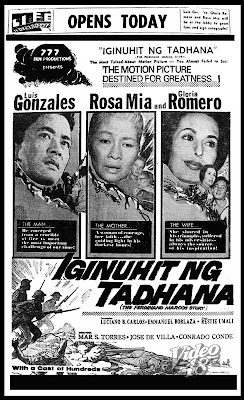 "IGINUHIT NG TADHANA" (1965): DID MARCOS KILL NALUNDASAN? Iginuhit ng Tadhana, a political propaganda movie, tells of the life and exploits of then Philippine Presidential candidate, Senator Ferdinand E. Marcos (played by Luis Gonzales). 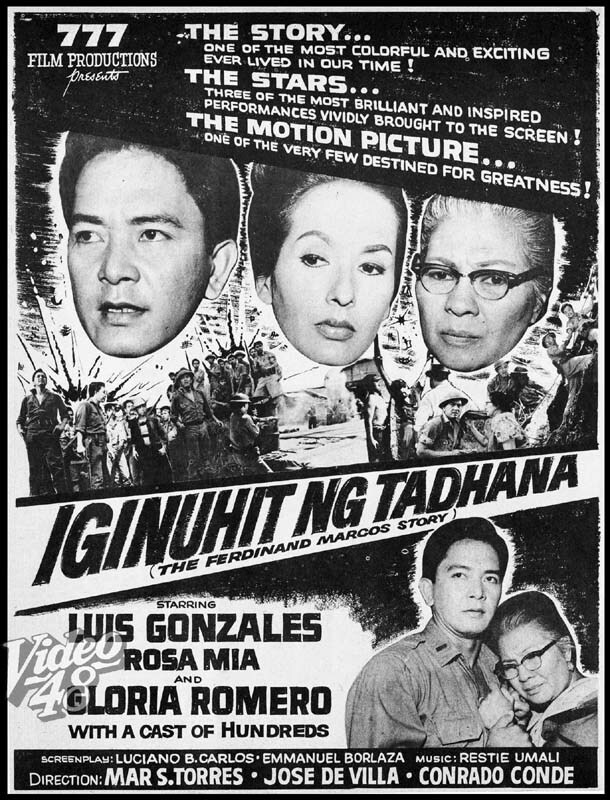 One of the highlights of the two-and-half movie was the celebrated Nalundasan case, where the young Marcos was accused of murder. Was he guilty of the crime or not? 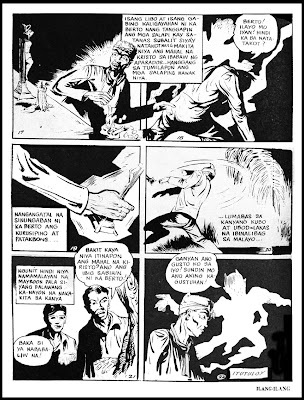 Ferdinand Marcos, along with his father and two uncles were arrested and charged with the murder of Nalundasan in 1938. In April 1939, Marcos received Bachelors of Laws and studied for the bar examinations while in prison. He posted bail in August the same year to attend the bar exams. 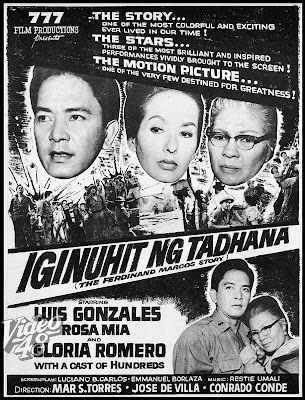 In September 1939, Marcos, his father and two uncles stood trial before Laoag Provincial Court of First Instance. In November 1939, Ferdinand Marcos was summoned by the university dean on suspicion of cheating in the bar exams. Marcos managed to justify his extremely high marks but was not allowed to take oath as his own trial was still pending. 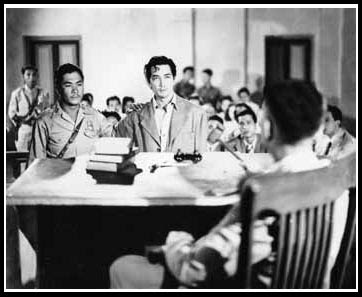 Some months later Marcos was found guilty by the Laoag Provincial Court and sentenced to imprisonment. 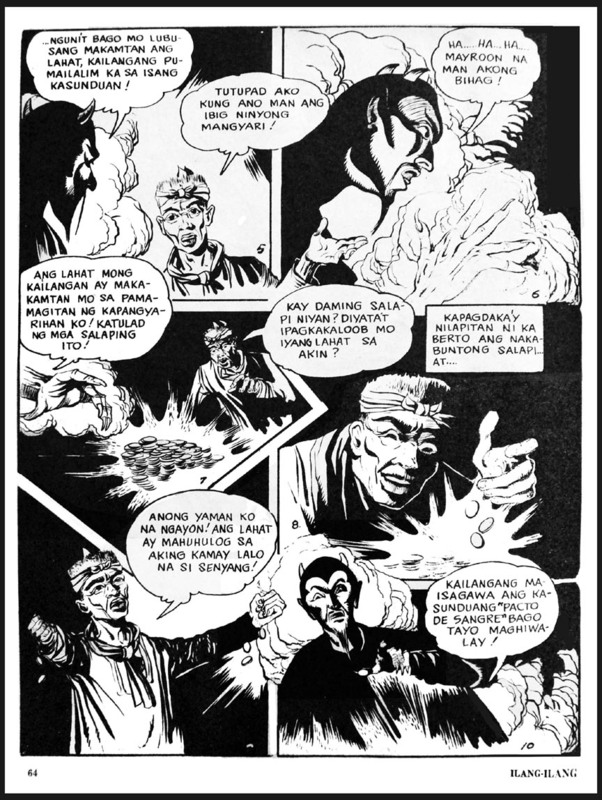 Marcos appealed to the Supreme Court and defended himself (see clip below). The Supreme Court under Justice Jose P. Laurel granted Marcos acquittal after finding the prosecution's case contradictory. In effect, Marcos has won his first case before he had even started to practice law. 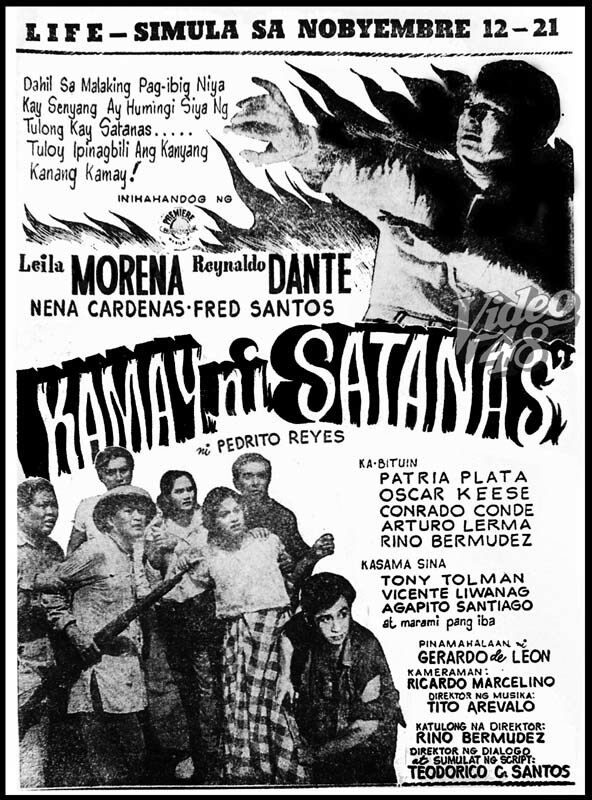 The Philippine Free Press called him lawyer of the year in the November 12, 1940 issue. 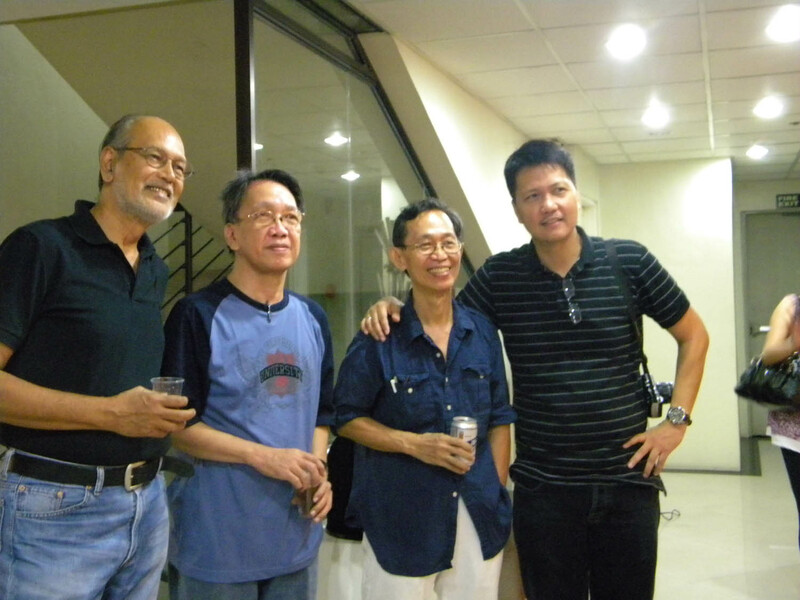 Marcos became a trial lawyer in Manila. 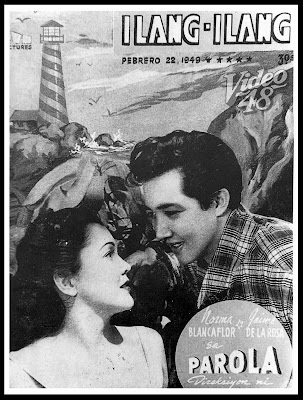 Set against the backdrop of an isolated and solitary lighthouse in a remote island, Parola tells of a man named Juan Moreno (Jaime dela Rosa) falsely accused of murder and sentenced to a jail term. 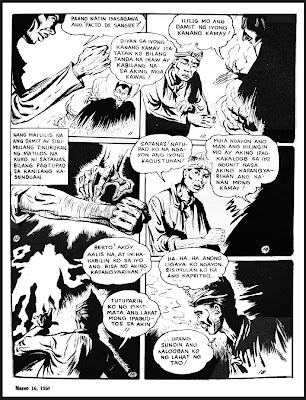 Believed to have been drowned along with the other prisoners in a shipwreck on their way to a penal colony, Juan was swept away on an island where Mang Pekto (Gil de Leon) and his family had isolated themselves. 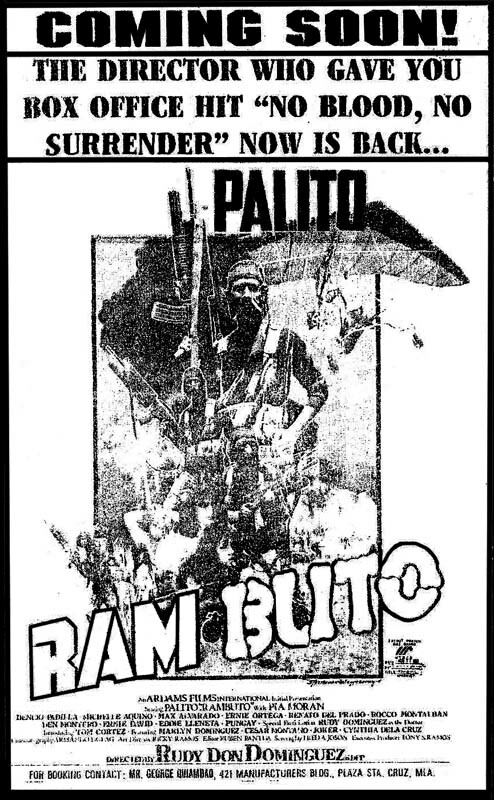 Pekto abandoned city life when he discovered his wife’s infidelity. 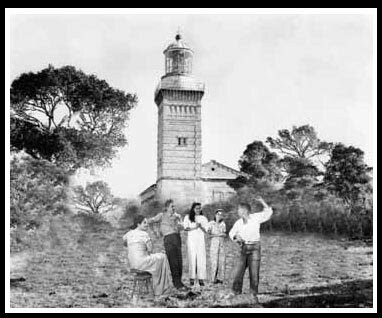 He took refuge in this island with his daughters Lilian (Norma Blancaflor) and Estrella (Priscilla Cellona) and sister Lalia (Naty Bernardo). After recuperating, Juan disguised himself as Juaning Marcelino. He soon fell in love with Lilian. However, Rolando (Jaime Castellvi), the captain of the ship that delivers supplies to the family, was also in love with Lilian. He found out Juan’s true identity and informed the authorities about it. Juan was arrested. For a time, Juan’s case was reopened and with new evidence recovered, he was acquitted. Pekto and his family, on the other hand, went back to the city hoping to live a normal life. 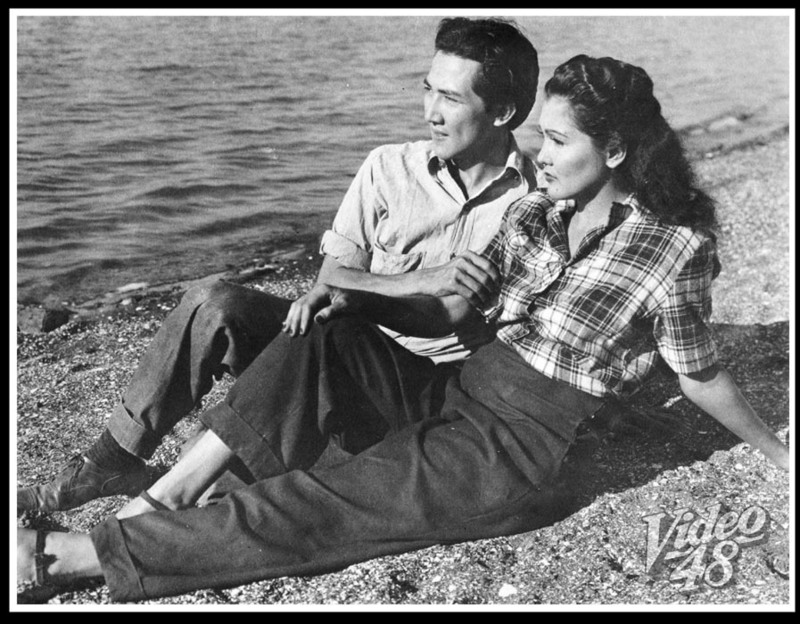 Juan and Lilian are eventually reconciled. 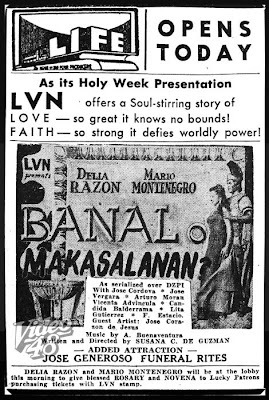 Based on a radio serial by Susana C. de Guzman, Banal O Makasalanan (1955) tells of Salome (Delia Razon), a seductive and alluring daughter of Herodias and stepdaughter to King Herod (Joseph de Cordova), who discovers faith and Christianity through her love for a Roman centurion named Cornelius (Mario Montenegro). A prophet named Juan Bautista (or John the Baptist) denounced Herodias marriage to Herod, her former husband’s brother, as a sin. Herodias bitterly resented Juan’s denunciation and promptly ordered Juan’s arrest and wanted him killed. Herod, fearing that John may be the messiah foretold by prophecy, would not do it. However, Herodias devised a plot and used Herod’s birthday celebration as an opportunity to carry the plan. She let Salome performed a dance that pleased Herod no end. He offered her anything she desired. Encouraged by Herodias, Salome asked Herod for the head of Juan on a platter. Reluctantly, Herod was compelled to obey her desires and ordered Juan to be beheaded (see clip below). Salome had nightmares and sleepless nights because of that incident and Cornelius was there to comfort her. When news of a new prophet named Jesus gaining ground in the countryside, Cornelius was asked by Salome to investigate. Disguised as an ordinary man, he seek out the Man they called Jesus. Through his own eyes, he witnessed how Jesus performed miracles like using only a few loaves of bread and several fish to feed thousands of men, women and children. Cornelius told Salome about this and asked her to go with him and lead a new life. Salome declined the offer. Salome asked Pontius Pilate’s help, Cornelius being one of Pilate’s men. With the help of Salome, Cornelius was arrested and because of the gravity of his crime he was sentenced to die. This was not what Salome wanted to happen and beg Pilate for mercy and to spare his loved one. Instead, Cornelius was given 20 whip lashes on the face that caused him to get blind. Disabled and incapacitated due to severe punishment, Salome asked Pilate for Cornelius’ freedom which Pilate acceded. She asked for Cornelius forgiveness and promised to take good care of him. The movie ends at Golgota, where Salome with Cornelius, seek Jesus for repentance and atonement. A miracle happened as Cornelius' eyesight was restored (see clip below).